I'll be planting some of the white greasy beans songbird sent me (as well as a bush variety), and am wondering about trellis requirements . I have a few feet of 6x6" welded concrete re-wire , will that work OK ? I read that these can get over 7 feet tall , and that's why I ask . I've been using tomato cages made from this stuff for a few years now , works great for them . Field peas like it too , but tend to crowd out the 'maters . I guess I could cut the re-wire in 7 foot lengths and stand them up on end ... one consideration is blocking sun from other stuff - I haven't made any decisions yet for exact planting layout except tomatoes , strawberries , and salad stuff . I grow English peas and some field peas in raised beds on just such "trellises" made from 6" reinforcing fabric. My preference, though, is wire field fencing that's 3x6 mesh along its lower part and 6" square mesh along the balance of its height. Mine are permanent appliances that zig-zag across the beds in a "accordion" pattern. They're easily handled by one person, peg in place easily (tent pegs), collapse pretty well for storage, and support the wintertime covering's framework. The challenge of course, is remembering to install the fence wire trellises "upside-down" so as to be able to reach through for weeding and cultivation;-) In my garden today, I have some strawberries finishing up, English peas just about done,edible turnips tops and roots, mustard greens going to seed, spinach and carrots producing well, late mustard greens, turnips, carrots and spinach, along with onions, late English peas (that I hope can take the sun), and Provider bush snap beans growing. Soon to be planting (not necessarily in order): More English peas, more bush beans, field peas (crowder peas), okra, eggplant, peppers, and (maybe) tomatoes. I'll be starting the last three in paper cups to make transplants. * I now have a total of 45 house plants growing with the intent to sell at the Farmer's Market on the Friday/Saturday before MD . The co-op is supplying hanging baskets for a good price , I might break even on this ! those came to me via Mr. Peek who used to post here but i've not heard from him for quite some time. i'm glad they are making it back further south so they can do better with the longer season. i put my climbing beans only on the north fence so that i don't have to worry about them blocking the light to other plants. 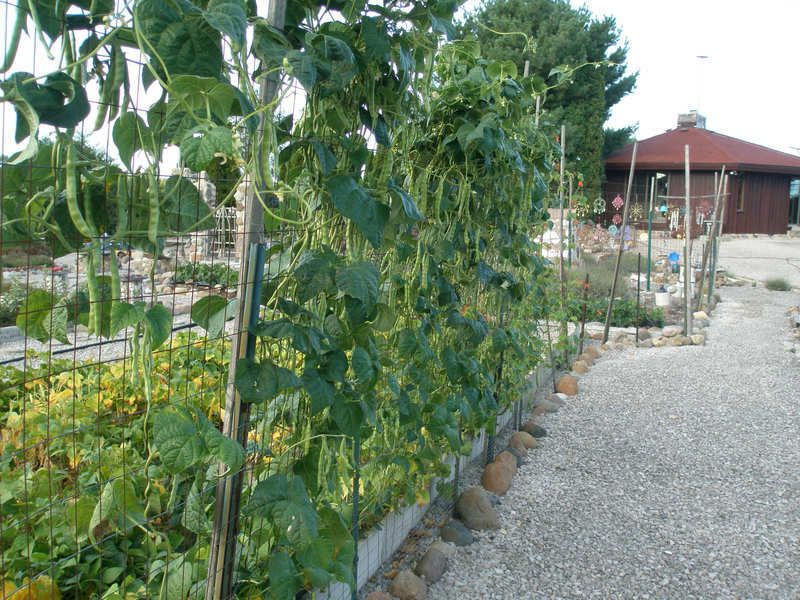 the amount of space needed to grow a lot of the climbers as compared to the semi-runners and bush type beans is why i largely do not aim for pole beans for most of the gardens. i just don't have that much field space or fence space for them. interwoven cement reinforcing is likely just fine to use. :) might last a bit longer than welded mesh that isn't interwoven at all. Hello bird and others, I'm finally back. Had some surgery that didn't prod uce the expected results, left me confined to a wheel chair. All the garden ing I do anymore is in my mind. You are correct about the greasy beans, they climb like crazy. I used to us e a woven wire trellis set to 6'. The beans would climb to the top and eith er fall down and reclimb or become a woven tangle between rows (the shade i s nice in hot weather). I've had to crawl between rows to pick. awww drats! sorry that didn't go well. but am glad to hear from you here (and via e-mail if you want to write anytime). but it actually didn't do well as we had a pretty long drought and i must not have gotten enough water to them. the pods looked full, but the beans inside were not fully developed and i didn't know it until harvest time when shelling how it went. i was hoping for a total bean crop of between 50-100lbs and had about 20 lbs. trying to be patient waiting for the next growing season to start off. projects planned. still freezing here over- night. as usual will not be planting much of anything until May towards the middle and end and into early June. i'm not planting anything when the temperatures are still well below freezing at night (last night, next week two days below 20 in the forecast, etc.). once the overnight lows stay more in the 40s then it may be possible. Peas, carrots, and spinach are in. We'll have some cold nights yet, but the usual problem with those crops is too late, not too early. Can replant if needed. Garlic went in last fall, but it was old garlic from the season before, as the fall before last went to bleep in a handbasket. We'll see if it does anything. i've yet to manage to kill off all of the garlic. years ago i was planting several hundred cloves, now i'm down to 20-30 and that is plenty. i'm also digging it out of one large garden so i will have plenty of green garlic this spring when i get back to that project. ha, there's always at least one weed to fight off. in our case there are plenty. i just pick one garden here or there a season to renovate. if i could get rid of the remaining lawn/grassy areas that would save me many hours of weeding a season that could go into growing vegetables or dry beans or more flowers. converting grassy slope to garden for next year? What flowers would you give someone,who a partner has left you to be with?